This Monday it is all about Jen from personal style blog Jen's Outfit Journal. We love Jen's funky way of mixing and matching textures and unique styles to create her own lovely, individual style! 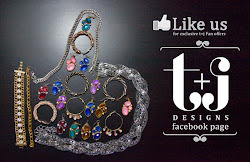 Take a look at how she would style the t+j Designs Sapphire Blue Crystal Bracelet & Fuchsia Crystal Necklace shown below. Jen's first ensemble shows how she would style the Fuchsia Crystal Necklace for day. She paired a simple dark red maxi dress with a dusty-rose colored sweater from Forever 21. We love how she continued the beautiful oxblood hue in the skirt up to her feathered fedora! She completed the look with a casual Urban Outfitters messenger bag and other silver accessories. The necklace works great with this relaxed look because it adds just the right amount of shine, but isn't over-doing it for day. Jen not only shows us another way to style the necklace, but also an innovative way to style a maxi skirt! She layered the dark red maxi from above with a shorter, patterned dress with a waist tie. Such a fun way to style a maxi skirt for chilly weather! Layering is the key to warmth! We love how the necklace picks up the hints of pink in the printed dress and adds a shiny element to dress up her layered-look. 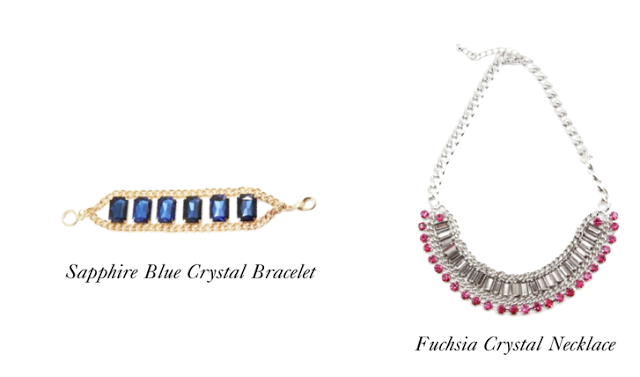 According to Spring 2013 trend-predictives, blue is going to be a very popular shade for the season! 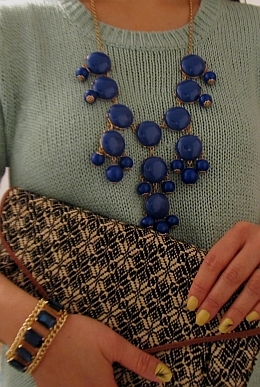 Jen shows us how to style a few different shades in one outfit with the help of the Sapphire Blue Crystal Bracelet. The key to rocking a few shades of the same color is having at least one of the shades in two places. This helps to make the look flow instead of looking "thrown together". In this particular look, Jen stayed consistent with the sapphire blue color in the bracelet and her necklace. And how adorable is her printed clutch by Lela Rose for Payless?! Special thanks to Jen and her fun take on mixing & matching! What was your favorite look from Jen? Stay posted to see how the last blogger styles these two pieces on Wednesday! I love Jen's blue necklace and maxi dress!